- Pick a place that is personal to the bride and groom. A location with a backstory (even an ordinary-looking location) will change the feel and atmosphere of the entire wedding. - …your homework. If you breeze through this decision and just Google venue ideas, you’ll end up with a VERY popular location that is often littered with brides who think their wedding is unique. - Consult a wedding planner/concierge/events manager who is very familiar with your possible venue to find out restrictions. For example; if it is important to you to have a Party Band to play at your reception, you can eliminate venues that don’t have the power or space requirements. - Write down your ideas for environments and prioritize them: Outside vs. Inside; Winter vs. Summer; Beach vs. Mountains (or other settings); etc. Eliminate your least preferred environments, then start searching by area. -…Think you have all the time in the world. Too many “compromised” venue decisions happen because brides/planners wait too long to book a venue. 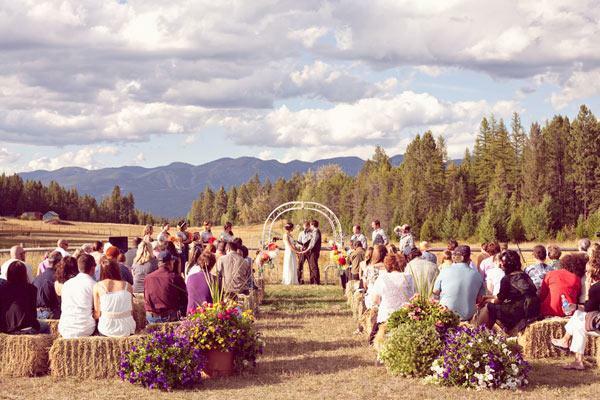 Most destination wedding venues are booked at least a year in advance. -… settle for multi-use venues. Hotels are usually good, but unless you are really into golf (for example), getting married on a golf-course can be overdone; it can also be a little tacky--definitely not a unique wedding idea. -…forget about your guests. True, it is all about the bride and groom, but if most of your guests are used to cold climates and you bring them to the virgin islands, a lot of their attention will be diverted to how hot they are rather than you and your unique wedding. Just a quick word on wedding planners. Many planners (the good ones) have been doing this a long time and know what works and what doesn’t; this is invaluable experience. However, an average wedding planner will let you know what has worked in the past and convince you to replicate it; a GREAT wedding planner will work with your personal ideas and come up with something that works for YOU. 1.) Pick the right caterer. You may have to have an idea of what you want before you get into hiring your food provider as many caterers specialize in specific areas of culinary craft (just like restaurants and cooks). 2.) Keep your guests in mind. You’re not going to be able to please everybody, but at least keep allergies and general preferences in the forefront of your mind. 3.) Pick the right venue; again, some venues make you use their catering staff, so don’t get stuck with a venue with restrictions you can’t live with. Deciding what kind of atmosphere you want can be complex or easy. If you are in and "of" the country, obviously a country band or a bluegrass band is the way to go; but if you are going more traditional, decide on an atmosphere: Classy? Lively? Subdued? Exciting? Modern? Jazzy? You can talk to a lot of bands and musicians but in the end, all you know is that everyone says they specializes in everything and everyone is the perfect fit for you (uhh… huh). A good talent agent can tell you which bands are available, what you’re looking for, and in your budget. Like wedding planners, music planners (agents) can either be average and tell you what has worked in the past, or great and work with your vision of how things can go. Let your agent know that you want something unique and you’d be amazed and what is available: Children’s Choirs, Ethnic bands, fire breathers, cowboy poets, aerialists, circus acts, Celebrity tribute bands (or just celebrities themselves), and the list goes on and on. These are just some of the ideas you can make your destination wedding unique and memorable. Avoid the pitfalls and stereotypes and your wedding will be personal and timeless.